Sunrise Cay Port Of The Islands Condos: Three bedroom THREE FULL baths 1814 sq. ft. waterfront condo with boat slip on seawall for up to a 22' boat. Spectacular view over wide canal from 25 feet wide lanai, living room, kitchen and master suite. Kitchen features a water view breakfast area, hard surface counter tops, self cleaning stove, microwave, dishwasher, two door refrigerator with ice and water dispenser and garbage disposal. Master bath has walk in closet, hard surface counter top, dual basins, tub and shower. 2nd and 3rd baths have hard surface counter tops and tub/shower combination. Excellent boating and fishing in the Ten Thousands Islands and direct access to Gulf. Port of the Islands has its own Collier County fire station (with fully trained EMS firemen who usually respond to any emergency (including medical) in Port of the Islands inusually under 3 minutes) and reverse osmosis water treatment plant. . 20 miles to downtown Naples for shopping, restaurants, and attractions. 15 miles to Marco Island. 75 miles to Miami. 50 miles to SW Florida International Airport. Orchid Cove Port Of The Islands Condos: Awesome water views from living room and master bedroom of this 2BR/2BA + Den 2nd floor end unit in Orchid Cove at Port of the Islands. Building located on the "big bay" and on the point between the Bay and the river with large back yard, all enjoyed from a 25ft lanai. Ample kitchen cabinets and counters allow extra storage and work areas. Tile backsplash in kitchen and bathrooms, solid surface counters. Tiled walls in bathroom & under kitchen bar. The large community heated pool and spa at the clubhouse, tennis/pickle-ball court and many activities. Port of the Islands boasts it's own Collier County Fire Station with 24/7 staffing including EMS staff & is located adjacent to the Ship's Store at the Marina with boat ramp, fuel and bait as well as many food items. Onsite Resort Hotel with restaurant and bar, Property is surrounded by State and Federal Preserves. Peace and quiet in a lovely community only 15 miles to shopping, restaurants and more. Shooting range and golf courses nearby. Come visit this piece of paradise! Excellent fishing in the Ten Thousand Islands and the Gulf. Only 20 mi. to the heart of downtown Naples. 14 miles to Marco Island and its beaches. Must see! Orchid Cove Port Of The Islands Condos: This 2 Bedroom 2 Bath Condo can be described in One Word; "BEAUTIFUL". You will think that you are living in a MODEL HOME. A "MUST SEE"! This one owner condo has over $46,000 in TOP OF THE LINE UPGRADES and IMPROVEMENTS. Real Hardwood floors in living room, dining room and both bedrooms. Master bedroom offers a custom California Closet. Main bathroom remodeled with gorgeous tile, quartz counter, and crown molding. Kitchen has additional custom cabinets, quartz countertop, tile backsplash and custom built-in office area. Guest bathroom has all new tile, marble counter top, upgraded fixtures. New Wood Fans in each room and Custom Soft Shades on all windows. Plus many more Upgrades throughout the condo. Located in Orchid Cove, within the serene and peaceful community of Port of the Islands, surrounded on all four sides by thousands of acres of wildlife protection areas. Orchid Cove has it's own clubhouse, pool, Jacuzzi and tennis courts. Port of the Islands Marina offers boat slips for rent or sale and it's own Public Boat Launch. Some of the BEST FISHING in Florida is in the nearby Ten Thousand Islands. 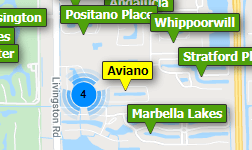 Just 15 minutes from retail, groceries, restaurants, Naples and Marco. Orchid Cove Port Of The Islands Condos: Click on the link above to view the 3D virtual tour! This second floor unit boasts 1402 sqft and one of the best views in Orchid Cove. With wide water views from the great room, master bedroom and lanai, this unit makes it easy to sit back and enjoy the enviable Florida lifestyle. The open floor plan gives you 2 bedrooms plus a den, and 2 bathrooms. The light and bright kitchen offers plenty of storage/counter space, along with ample recessed lighting and a breakfast bar as well. This condo is perfect for an investment, part time, or full time residency, with key features to include hurricane impact windows/doors, vaulted ceilings, and a 1 car attached garage. Just a short walk to the community pool and clubhouse, you can also enjoy all the great restaurants and shopping Marco Island and Naples have to offer. Be sure to schedule your showing today! Orchid Cove Port Of The Islands Condos: Welcome Home! Updated 2 Bedroom, 2 Bath First Floor End-Unit with tranquil lake view. Upgrades include beautiful wood floors, complete whole house reverse osmosis system, NEW stainless steel convection stove, NEW dishwasher and NEW hot water heater. There are also hurricane proof doors, windows and sliders for additional peace of mind as well as a ONE YEAR HOME WARRANTY. You can fish for bass, snook and exotics like peacock bass right out the back door and view the Everglades wildlife all day long from your screened lanai. Enjoy easy access to freshwater, backwater and gulf fishing with restaurant and Marina across US-41 where you can own a slip starting at $28k for a 28 ft boat. No Red tide here ever! The community features an Olympic size heated swimming pool, hot tub, tennis, pickle ball courts, clubhouse and low HOA fees. Located just 15 minutes to Publix, Fresh Market, Wal-Mart, Lowes, and at least 15 restaurants, and 20 minutes away from Marco Island, Everglades City and the City of Naples. Only 80 miles to Miami so let this be your home away from home! You can have it all, your private retreat and no worries for 1 full year.... Come and see this lovely end unit! Orchid Cove Port Of The Islands Condos: Most desirable location on the Fakaunion River at Orchid Cove at Port of the Islands. Even Hurricane Irma at category 4 produced ZERO flooding in our unique community on the edge of the Everglades and surrounded by State and Federal preserves. New wood-look flooring in living areas. Across US41 is a Hotel Restaurant/Bar, Marina, Ships Store, launch ramp, docks for lease or sale, fuel and County Fire Station with 24/7/365 coverage including EMS personnel. Orchid Cove has a clubhouse, community heated pool and spa, tennis and pickleball court. Orchid Cove teems with local wildlife and birds! With the lowest condo fees at Port of the Islands, your dues still provide landscaping and professional management, building insurance including Flood & Hazard coverage for the exterior. Pavers line all driveways and sidewalks with generous guest parking in addition to your garage and driveway. Many activities occur during the Winter months including Bingo, football parties, card nights, and even community gatherings A very friendly community! Come and visit our peaceful paradise with shopping only :15 away! Orchid Cove Port Of The Islands Condos: The PERFECT ANSWER for condo living at an affordable price in Southwest Florida in a quiet boating and fishing community! This first floor 2/2 condo with an attached garage is located at Orchid Cove in beautiful Port of the Islands, the gateway to the Florida Everglades. You will not only enjoy this wonderful condo, but also the amenities of Orchid Cove AND all the benefits of the Port! Orchid Cove has a pool, spa, tennis, pickle ball, and many winter social activities and event. Across Hwy 41 is the Port of Islands marina with wet or dry boat storage, boat launch, ship’s store, restaurant, and fishing pier! Bird watching, eagle watching, dolphins, manatees, and all the wonders of nature are yours to enjoy. This community is only a few minutes from downtown Naples and/or Marco Island. Beautiful nature just minutes to the best shopping and dining in SW Florida! Come and see!! Orchid Cove Port Of The Islands Condos: Watch beautiful sunsets from your extra-large Lanai overlooking a lake at this beautiful 2 bedroom,2 bath, open plan Condominium. This unit has vaulted ceiling, large kitchen, breakfast room, smooth-top range, extra large lanai, large master bedroom with huge closet. Lots of space with 1400 sqft. also comes with a attach garage with storage. Orchid Cove has its own clubhouse with activities, large pool and tennis courts. This property is a must see. Fire station, marina with docks available, near by. Just 15 miles to Marco Island, 20 miles to downtown Naples for shopping, restaurants and attractions. This condo has everything beauty and convenience. Orchid Cove Port Of The Islands Condos: C.14664 BEST VALUE! Welcome Home to this spacious and immaculate 2 Bedroom/2 Bath First Floor End-Unit with water views in ORCHID COVE! PRICED TO SELL! Upgrades include new flooring in main living areas. Granite counter tops in kitchen/baths. Generous living room and dining room for entertaining and relaxing. Garage, Paver driveway, and ample guest parking available. Relax on your lanai to a gentle breeze and beautiful water view. Nature, beauty, tranquility define this community with Clubhouse, Pool/Spa, Tennis courts, and walking paths to enjoy the Florida lifestyle. Port of the Islands Marina provides boat storage and direct access to fishing and boating in the 10,000 Islands and Gulf of Mexico. Orchid Cove is one of Naples Best Kept Secrets! Sunset Cay Lakes Port Of The Islands Condos: Live in a true resort/boating community at an affordable price with this condo that is full of upgrades! Wood and tile floors, electric storm shutters, lake view, boat ramps, a marina, and boat parking right in the community. Also, detached garage. Sunset Cay Lakes Port Of The Islands Condos: Desirable first floor condo featuring 2 bedroom, 2 baths, washer and dryer plus a detached garage. Lovely, peaceful view of the lake from your screened lanai. Close to the Marina, boat ramp, Ship's store and hotel with restaurant and bar. Villages Of Stella Maris Port Of The Islands Condos: Beautifully furnished two bedroom two bath condo within minutes by boat to the 10,000 Islands. Condo has been completely repainted, stainless steel appliances, upgraded kitchen cabinets, granite counter tops in kitchen and bathrooms, tile throughout and move in condition. BOATING COMMUNITY - boat storage on property or Port of the Island Ship Store and Marina adjacent to community. Marine fuel, dry boat storage, live shrimp, boat ramp, tackle, beer, wine and snack foods all available at the store. Port of the Island Hotel adjacent to community with great restaurant Very quite area of Naples but just 15 minutes to Marco Island, shopping, restaurants and 30 minutes to downtown Naples. Public Golf Course just 10 minutes away. If you love to boat and fish this is the perfect location.